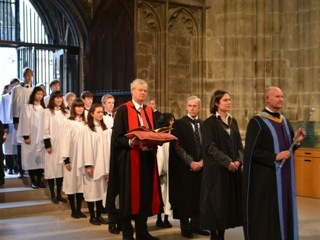 Cressida Williams (second from right) in the procession at Canterbury Cathedral. Cressida Williams, originally from Annes Grove, Castletownroche, Co Cork, in the Diocese of Cloyne (whose parents still live in Castletownroche Parish) had a bird’s eye view of the enthronement of the new Archbishop of Canterbury, the Most Reverend Justin Welby, this week. Cressida holds a senior position at Canterbury Cathedral as Cathedral and City Archivist. She leads the staff team at the Cathedral Archives, where the historic records of the Cathedral are preserved and made available for consultation, together with the records of the City, the Diocese and parishes in East Kent, and related manuscript collections. Cressida qualified as an archivist in 1997, and has particular interests in medieval charters and seals, and architectural records. Cressida is a past-pupil of Mallow (No.1) National School in the Diocese. This entry was posted in Church of Ireland, Community Involvement, Diocese, Lay Ministry, People from the Diocese, Schools in the Diocese. Bookmark the permalink.